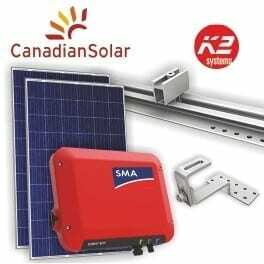 The solar kit includes everything you need to install the system. Canadian Solar Inc. is one of the leading solar manufacturers in the world, delivering industry leading high efficiency solar cells, solar modules, solar power systems and off grid solar power application solutions. Canadian Solar was founded in 2001 in Toronto, Canada by Dr. Shawn Qu, President and CEO of Canadian Solar.Canadian Solar (NASDAQ: CSIQ) operates as a global energy provider with business subsidiaries in 20 countries on 6 continents. Besides serving as a manufacturer of solar PV modules and provider of solar energy solutions, Canadian Solar has a geographically diversified pipeline of utility-scale power projects. With the company’s recent acquisition of Recurrent Energy, Canadian Solar’s total project pipeline is now 9 GW, including an increase in the late-stage project pipeline to 2.4 GW. With two state-of-the-art manufacturing facilities in Ontario, Canadian Solar employs over 7,500 workers worldwide. This translates into more than 12 GW of panel shipments, or 30 million PV modules, in the past 14 years. Join our ZERO Home Bills Community. BEST Products from the BEST Brands at the BEST Prices available in your market delivered by Solaranna. Are you looking for a SMA Inverter? You can find them here.